People who visit New York for the very first time are generally struck, while arriving at the accesses of the Manhattan Island, the impressive height and diversity of the buildings and skyscrapers are there. Indeed, New York is considered the second largest city and found the most skyscrapers in the world after Hong Kong. Get to know some of the tallest skyscrapers of this great American city. Even if the construction was not completed until 2013, One World Trade Center, also known as the Freedom Center, is currently the tallest skyscraper in New York. This tower is part of a complex of four towers to replace the twin towers of the World Trade Center, destroyed in the infamous historical events of 11 September 2001. Giving the impression of being constructed entirely of glass, this office tower that contains a restaurant and an observatory has 108 floors and is about 541 meters high. The famous Empire State Building is the second tallest skyscraper in New York, with its 443 meters for 102 floors. This Art Deco style building, the giant gorilla King Kong already climbed more once with the cinema, was even already regarded as highest of the whole world. An observatory located at the 86th floor offers visitors a panoramic view of New York. Bank of America Tower is in third place, with its 366 meters. This post-modern style office building has the distinction of being a skyscraper environment. It has been designed with sustainability in mind: wind turbines, heat-trapping insulation, rain water reuse system and air filters are part of its attributes. It is constructed primarily of recycled and recyclable materials. The Conde Nast Building is 341 meters tall and has 48 floors. Also post-modern style, this building is also considered environmentally friendly. Its offices are mainly used by Conde Nast Publications, a publishing house that publishes many American magazines such as Vogue and Vanity Fair. 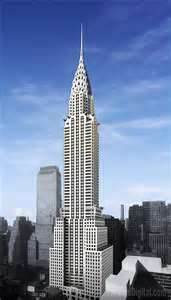 The Chrysler Building is 319 meters high with 77 floors. Its Art Deco style reminiscent of the Empire State Building. Chrysler Corporation formerly occupied the building, but left in the 50s. Stores are located in the first floor of the tower, while others are mainly occupied by offices. The Chrysler Building is an icon of the New York city, and is enjoyed by many of its inhabitants. The New York Times Building is about the same height as the Chrysler Building, but has 52 floors. If it reaches 319 meters, it is because a glass wall and an antenna placed at the top, the roof is actually at a height of 228 meters. The New York Times Building is mainly occupied by The New York Times Company. Space of events including an auditorium, a gallery and a banqueting hall occupies the first floor. During your next visit to New York, try to identify these skyscrapers among all others who stand in the sky of the city!